Drawing Cartoons: It's Fun, Easy, and Anyone Can Do It! It's Fun and Totally Easy! 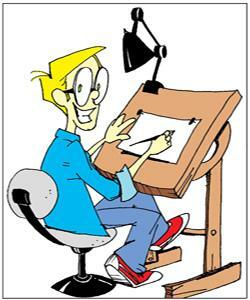 Have you ever wished you could be drawing cartoons like the ones you see in newspapers, magazines, or on TV every day? Do you just want to be able to draw a fun cartoon to spruce up your stationary, or add a unique style to your report or presentation? Well, you can, and it's easier to do than you think! Whether you've been doodling for years, or whether you've never picked up a pencil in your life, this site is for you! Follow my simple, step-by-step drawing lessons and in no time you'll be drawing your own cartoon characters! Use them to make your own comic strips, greeting cards, or comic books! If you're already drawing up a storm, these lessons are a good way to practice and brush up on basic techniques! The information and advice I give on this site are taken from my own experiences as a cartoonist! And if you're just looking for a good laugh, be sure to visit my Daily Giggle page. You'll find a new cartoon posted each day, drawn especially for this site, using the same techniques shown in the Lessons pages. These cartoons are copyrighted by me, but feel free to print them out, share them with your friends and family, and use them for practicing your own drawings. Remember to visit every day for new cartoons. You can also visit the Daily Giggle Gallery to see past cartoons. Anyway, enough jibber-jabber! Click one of the links on the menu at left to get started. And, as always, happy cartooning!